MiO is brought to us by The Manhattan Toy Company. The holly jolly holidays are approaching and that means scratching your head to find the perfect present for every single tot on your list. Think three letters – M-i-O (mee-yoh). Manhattan Toy, makers of imagination inspiring products, has launched the MiO collection of open-ended play that’s been generating buzz with toy industry experts. These sets will provide open-ended play to inspire any builder's imagination.. Is it a house, a sailboat, a tree-fort? Do foxes drive school buses and play hopscotch? Of course! Give the gift of MiO today to the imaginative builder in your life. I was super excited to receive these sets, as just from the pictures... I thought they looked adorable! And I was certainly not wrong! They are SO cute!!! The first set we received was the MiO Car + 2 People. The MiO collection provides open-ended play to inspire any builder's imagination. 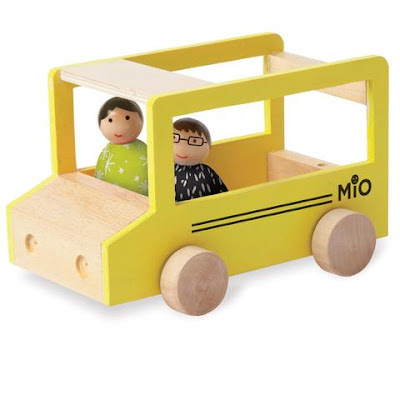 The MiO Car + 2 People set features a brightly colored wood car that fits two MiO people or animal characters. Included in the set are two people dolls with hand painted wood heads and soft beanbag bodies. The other set we received was the Woodland Fox & Skunk set. This MiO collection provides open-ended play to inspire any builder's imagination. 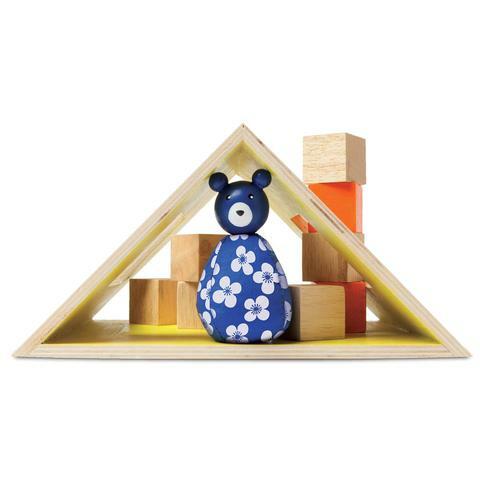 The Woodland + Fox + Skunk set features a mix of natural and brightly colored wood pieces. Open-ended play is easy to achieve with the simple wooden shapes and adorable fox and skunk doll character. The friendly animals have hand painted wood head and beanbag bodies. Perfect for little hands and tactile play. Set includes: 3 reversible tree/garden blocks, 1 grass plank, 1 reversible pond/ stream plank, 6 cubes, 2 MiO beanbag animals + drawstring storage bag. Look how adorable they are!!!! The kids leave them out on our little end table in our family room and I don't even care! I look over at them and they are so cute they make me smile! This set also has it's own little carrying satchel which all the pieces fit right in so nothing gets lost. 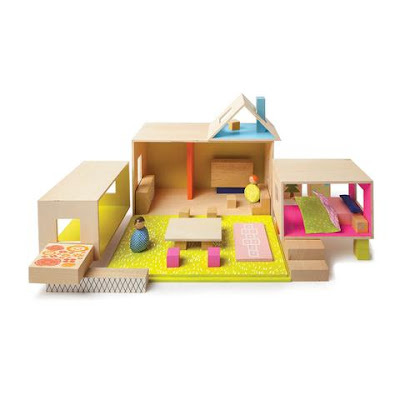 This 14 piece set gives them lots of building possibilities and options. Here are some more of the adorable sets available from MiO! MiO eating sleep working + 2 People 41-piece set! MiO provides open-ended play to inspire any builders imagination. Natural wood construction. The large storage box with built in handle cut-outs and fitted cover do double duty as large room and grassy patio. Includes 1 large room, 1 grassy patio, 2 rooms, 1 loft, 2 blocks, 1 hopscotch plank, 1 natural plank, 2 step pieces, 4 reversible tree/garden blocks, 4 pillars, 1 room divider plank, 1 graphic block, 15 cubes, 1 blanket, 1 pillow, 2 MiO beanbag people + drawstring storage bag. See it in action here!!! MiO is the Winner of several prestigious awards including: Parents' Choice, Parents Best Toy, National Parenting Product Award (NAPPA) winner, Oppenheim Toy Portfolio Gold Seal Award and Creative Child Top Toy of The Year Award - Open Ended Play category. The child development experts and toy reviewers of the prestigious Oppenheim Toy Portfolio, just awarded MiO its 2016 Gold Seal Award! The esteemed review organization exclaims, “A truly open-ended modular dollhouse that can be different every day,” begins their gushing critique. “The wooden boxes and roof can be rearranged horizontally, vertically and every which way. The blocks and fabric pieces can be a table or bed or whatever kids imagine." And I couldn't agree more! My kiddos have always enjoyed building with blocks, and adding the adorable creatures and people into it makes it even more fun! All these quality pieces are surface washable and the products meet or exceeds EN71 and CPSIA safety regulations. Check out all the things available at MiO from The Manhattan Toy Company. You or your kiddos will not be disappointed in what you find! !These sets will make for AWESOME Holiday Gifts! Special thanks to MiO by Manhattan Toys for allowing me to share about their wonderful sets this holiday season. Look for it in our 2016 Holiday Gift Guide! One lucky reader will win their own MiO Set from the line except for the $100 41-piece-set, based on availability. Giveaway is open to US residents, 18 and older. No PO Boxes. Use the form below to enter for your chance to win. MBP is not responsible for prize fulfillment, Please see our policies page for details. Special thanks to MiO by Manhattan Toys for allowing us to review and share about their awesome products, and for offering this fun giveaway for our readers! I think that the MIO PLAYING EATING SLEEPING WORKING + 2 PEOPLE is the cutest! Yes, I played with wooden blocks as a child! I'm loving the adorable fox and skunk. cute. And I loved playing with blocks as a kid!!! Yes, i did. I wish that we do give a chance for our kids to play and engage with such wooden blocks rather than electronic gadgets and toys. Thank you for this giveaway! I just think the roof of the MiO houses is so unique - no other block sets have that kind of hollow triangle. Manhattan toys promote STEM (science, technology, engineering and maths)... learn and evolve while play. Its so nice to find a well made quality toy like MIO... its definitely a win win for both parents and kids. Thanks for sharing the review and giveaway! I love wooden toys and that makes mio so special... Would love to win it for my girl. Thanks. 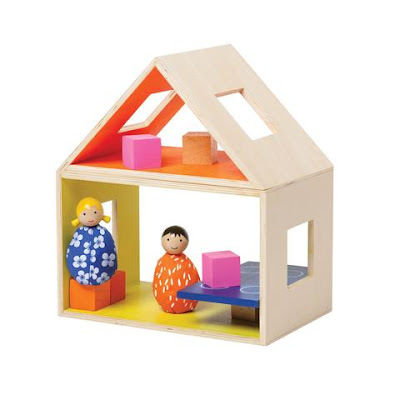 The wooden blocks I had as a child had the alphabet on them - but I love how these MiO ones can be arranged in different ways for pretend play! The triangle roof piece is my favorite!